So, just how bad is it? ‘Me Tarzan, you Jane’. Is this me? By citing the cases of Alberto and Wes in my last post, I may have given the impression that my Spanish is irremediably bad: that it has either pidginized to a similar degree as had Alberto’s English, or is only minimally grammatically inflected, like Wes’s. Fluency (i.e. the capacity to cope with production and reception in real time): 5/10 (although this varies widely depending on context and interlocutors); word-searching often halts speech; correct stress placement in polysyllabic words is also a problem in terms of fluid articulation; communicative effectiveness is often impeded by problems of comprehension that result from poor phonemic coding ability (also known as ‘a bad ear’). Complexity (i.e. ‘the size, elaborateness, richness, and diversity of the learner’s linguistic L2 system’ ( Housen & Kuiken 2009: 464)): 4/10: vocabulary range is serviceable for day-to-day production needs, and quite good for reading relatively difficult texts; however, key areas of grammar, such as pronoun choice, reflexive verbs, past tenses, ser and estar, por and para, etc., still operate in free variation – i.e. the choice of one form over the other is random and unsystematic. There is insufficient grammatical knowledge to express complex ideas involving modality and hypothesis, or to flag the logical relationship between utterances, or to vary and embellish a simple narrative. Appropriacy: (also known as sociolinguistic competence and includes the capacity to function in different registers): 5/10 – limited to mostly informal and one-to-one situations, due in part to difficulties choosing between tu and usted, and in using second person plural forms comfortably. Strategic competence: (capacity to compensate for a limited linguistic competence, e.g. to paraphrase, to repair breakdowns, etc): 4/10: I tend either to avoid situations where this might be put to the test, or to operate on a ‘wait and see’ principle, hoping that communication breakdowns will be resolved further down the track. 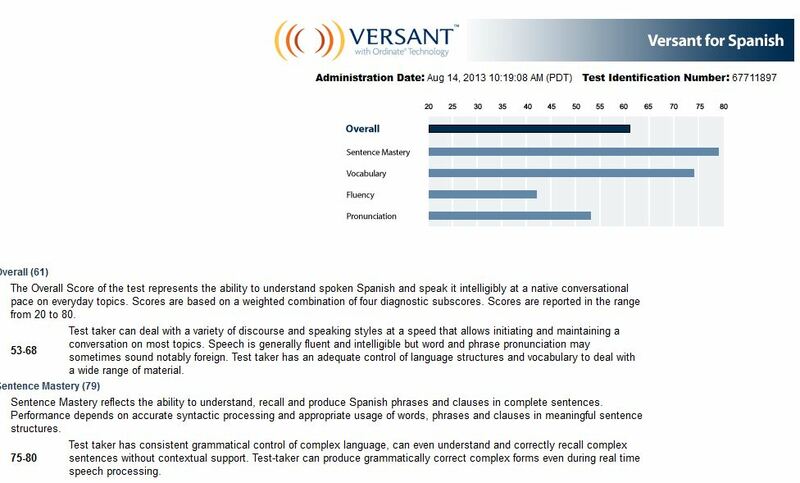 The Versant™ Test of Spanish, created by leading language testing experts using advanced speech processing technology, evaluates a non-native Spanish speaker’s ability to understand and to communicate appropriately in Spanish on everyday topics. Versant automated tests allow language teachers, program coordinators, and administrators to quickly, objectively, and accurately assess students’ levels of spoken Spanish skills. Making use of advanced speech recognition techniques, the Versant Test includes several different sections: Reading, Repeat, Opposites, Short Answer Questions, Sentence Builds, Story Retellings, and Open Questions. The test costs $25, takes about as many minutes, and is easy to do. Moreover, it’s an interesting experience, in that, in some of its sections at least, it requires a degree of spontaneity, combined with the pressure of working against the clock, that cleverly simulates the demands of real-time speech production. What’s curious is how polarized my accuracy and fluency results are – over-generous in terms of grammatical accuracy, but a little mean, I thought, about my response to the story-telling and open questions tasks. It also rates me more highly on the use of formulaic language than I do. (How does it know, you may well be asking!) Anyway, I plan to take the test again in a few months’ time, to see if it can detect any improvement. For those of an empirical bent, this will constitute the pre- and post-test elements of the study. Finally, having enrolled in a language school (of which more in the next post), I was level-tested using a customized online instrument that comprised a self-adjusting multiple-choice grammar test, followed by four short texts in C-test format. (A C-test is a kind of cloze test where the second half of every second word is blanked out and requires completion). Here you can see a screencast of me doing the grammar section (forgive the typically Spanish background ‘jaleo’!) Those of you who speak Spanish might like to make a preliminary assessment of my level. I was disappointed, though, that there was no test of my oral Spanish – surely easy to set up nowadays, using Skype. When I queried this, however, I was assured that, on Day 1, my speaking would be evaluated by means of an interview. How did I do? On the basis of the online test, I was provisionally placed in an advanced level (C1 on the Common European Framework), the actual placement being contingent on the speaking test. It seems, then, that both external assessments rated my Spanish more highly than I do, especially with regard to grammatical accuracy. What will this mean in terms of how I respond to formal instruction, I wonder? Specifically, will I be over- or under-challenged? Will the classroom experience penetrate the areas of my Spanish that seem to have stabilized? In what areas (accuracy, fluency etc), will I show improvement – if any? Housen, A., & Kuiken, F. (2009) ‘Complexity, accuracy, and fluency in second language acquisition’, Applied Linguistics, 30/4. Skehan, P. (1998) A Cognitive Approach to Language Learning, Oxford: Oxford University Press.